I'm taking it upon myself to make all official AJAMSONIC demos that I can find available over here. * At 00:20 - the new pads come in (assigned to LOWER1 voice). * At 01:54 - the new Choir voices (Ahhh and Ohhh) played by Chord 2 and Chord 3 in style come in as lead horns are played. Also new LIVE GUITAR comes in ... subtle ... but there. * At 02:45 - new Smart WALKING BASS LINES programmed into FILLS! These sort of 'lead the fill' into the next measure/bar. * At 03:01 & 03:18 - Listen to how the BASS line perfectly follows as 'decending chords' are played in real time on Arranger. * At 03:37 - Real Live Ending (Programmed into ENDING-1)... as you would experience with a LIVE band! Ending 2 and 3 are musical (following the official KETRON Style Programming guide)! I'm kind of wondering how smart can a bass line be, if it doesn't know what the next chord is until you play it? A 'walking' bass-line walks FROM somewhere, TO somewhere. It always knows where it is FROM, but it sure don't know where it's going TO! Oh well... Next year in Jerusalem! * if you press the FILL in a 7th, walk to a MAJOR. * if you press the FILL in a MAJOR, walk to a MAJOR. Of course depending on style of music you play, you still have limitations regardless ... but at least this gives you something to start with and as we develop more styles in different types of music, we will expand (also with hopes that the Arranger technology expands too), but for now, the bass line isn't too 'smart' ... yet, but better than having a redundant bass line through out the style Arrangement. 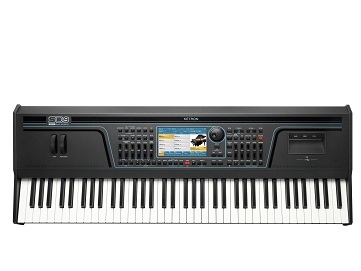 And your suggestion with the Chord Sequencer is well taken and intuitive indeed! More official AJAMSONIC demos as promised. I had to convert as original files too big to upload here. More official AJAMSONIC demos as promised. Generated in 0.022 seconds in which 0.006 seconds were spent on a total of 21 queries. Zlib compression enabled.